Aung San Suu Kyi led National League for Democracy and came to power in Myanmar during the historic general election of November 2015. Although the nation is still embracing the change, it is evident that the dawn of a more democratic era in this land is already prevailing – sanctions have been dropped and businesses are rushing in to Myanmar. 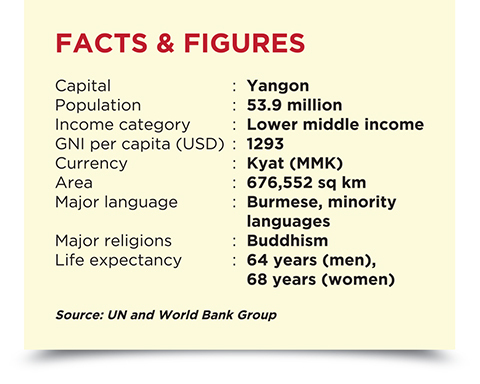 Previously known as Burma, the nation continues to open up to the outside world as the big cities and towns strive to display economic and social improvements worth noticing. Holding a history of political tumult and big-time investments, the country’s largest metropolis is also its’ commercial and intellectual hub. As a result of reaping the benefits of Myanmar’s recent political and economic liberalisation, a series of new restaurants, bars, and outlets is rising up in the city – an evidence of the city’s blooming cosmopolitanism. Nevertheless, Buddhist sites are the ultimate must-sees in Yangon. 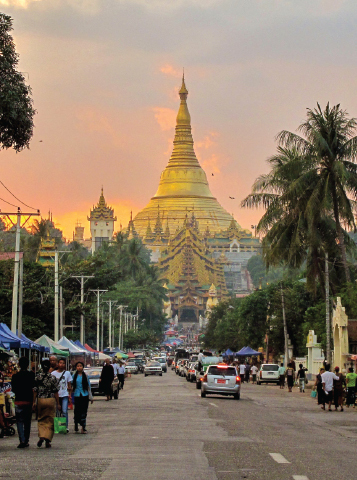 The gold-laden spire or zedi of Shwedagon Paya, the very symbol of Myanmar, soars almost 100m above Yangon and is believed to be one of the holiest Buddhist sites anywhere in the world. The golden rock of Mt Kyaiktiyo in southeast Myanmar is another pilgrimage spot of the country. Resting precariously atop a ridge, the eye-catching structure looks like it could collapse from the mountainside at any moment. Although not a city, Inle is one of Myanmar’s most iconic destinations that offers early-morning cruise, a cycle through the countryside, and sojourns into the surrounding hills and villages. Taking a boat trip, however, is naturally the most popular way to experience Inle Lake. 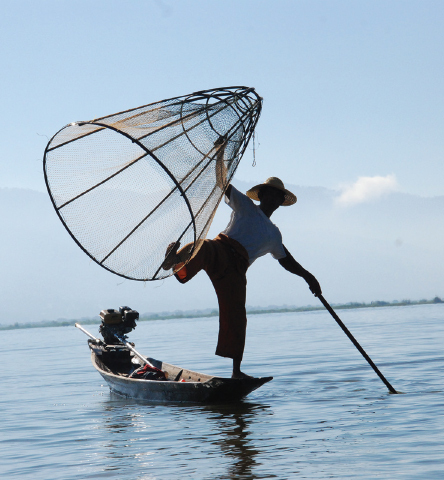 The Inle Lake region – fringed by marshes and floating gardens, is where Buddhist temples and stilt-house villages rise above the water, and Intha fisherfolk are observed for their unique leg-rowing technique while propelling their boats. 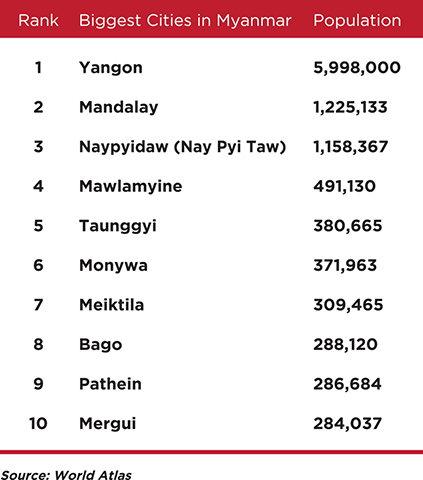 Surrounding the lake are hills that are home to myriad minorities such as the Shan, Danu, Pa-O, Taung Yo, Danaw, and Kayah. Burmese meals are usually served with white rice, accompanying a variety of side dishes such as fish, meat, vegetables and fruit curries or soups. As with most regions in the nation, the side dishes often include fresh ingredients consisting of vegetables and tropical fruits. Mohinga. Mohinga is Myanmar’s unofficial national dish. 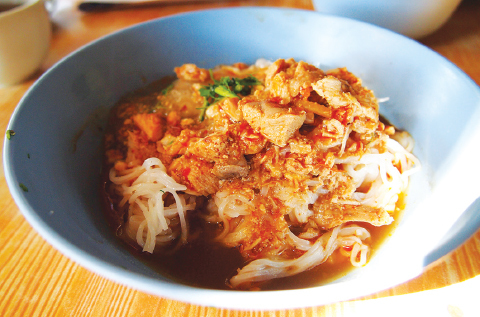 It features round rice noodles served in herbal fish and shallot-based broth, often supplemented with the crunchy pith of the banana tree and flakes of dried chili. 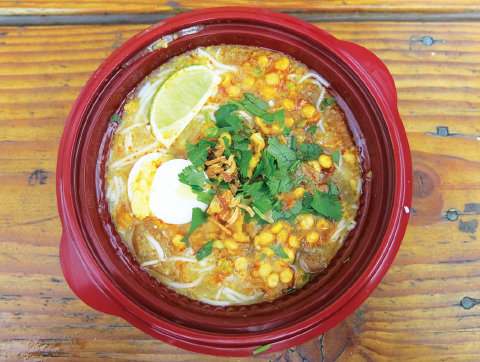 Mohinga is a popular breakfast dish and a common snack at any time of the day, sold by moving vendors. 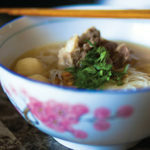 Shan-style noodle soup. This is another delicacy highly prized by the Burmese for breakfast or light meals between the main meals of the day. 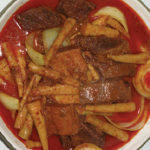 The dish features thin rice noodles with chunks of chili-marinated chicken or pork in a light broth. Although the dish is popular all over Myanmar, it is most common in Mandalay and Shan State. Another Shan-style dish worth seeking out is “kneaded fish rice,” a turmeric-tinged rice dish. Teahouses are not just a place for drinking and eating in Myanmar – it is the place for families and friends to commune with one another, and where business associates meet up for business networking and discussions. While the daily agendas take place, Myanmar tea is served hot, milky, and additionally with, or perhaps, sometimes unending – Chinese green tea. Besides Myanmar tea, teahouses also serve simple dishes throughout the day. 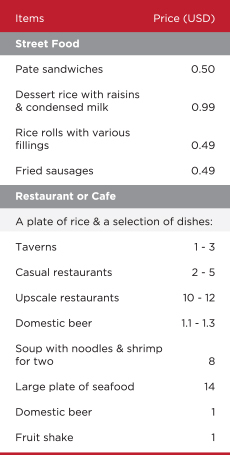 The food offerings, however, depend on the range of selection of the individual teahouse. Tea shops run by ethnic Burmese often serve traditional Burmese noodles or rice dishes such as htamin thoke, a type of rice salad. Indian or Muslim-owned tea shops are known for deep-fried savoury snacks such as poori, samosas, and baked bread such naan. Most often than not, the dishes and the desserts are entirely South Asian-influenced. On the other hand, Chinese-owned tea shops provide a range of meaty rice dishes such as meaty steamed buns and dim sums, as well as baked sweets. Laphet. 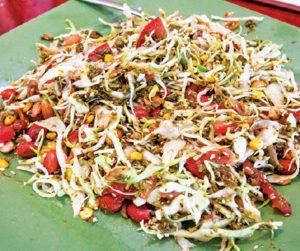 A popular finish to Burmese meals is laphet, a mixture of fermented green tea leaves and a combination of fried garlic, sesame seeds, dried shrimp, fried peas, and peanuts with other crunchy ingredients. The dish is a popular snack in Myanmar, despite its slimy-looking mass of leaves and its overall exotic appearance. One reason propounding this is the caffeine boost the tea leaves offer, which makes it highly desired among students who want to prevent themselves from falling asleep while studying late night. Cakes/pancakes. Semolina cake is another must-try in Myanmar. The outstanding Burmese snack combines crumbly semolina flour and coconut milk, supplemented with ghee and raisins, served in attractive diamond-shaped slices in restaurants. Another favourite is Burmese-style pancakes – bein moun and moun pyit thalet, served sweet or savory, which can be found at all Yangon corners throughout the day. 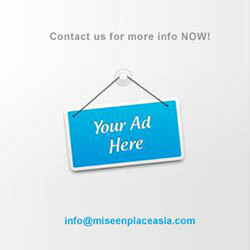 1/F 77-79 Pansodan Rd, Yangon. North of Ananda Temple, Bagan. U Ze Na Pagoda St, Mawlamyine. off Nanda Rd, Pyin Oo Lwin. 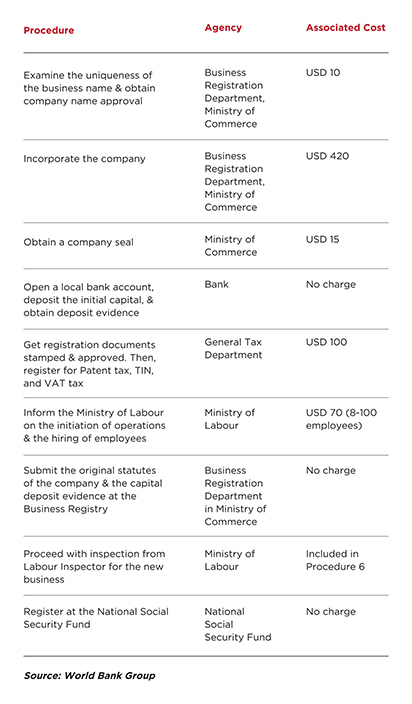 “A recent enacted Myanmar business law has resulted in a more favourable environment for foreign investors. 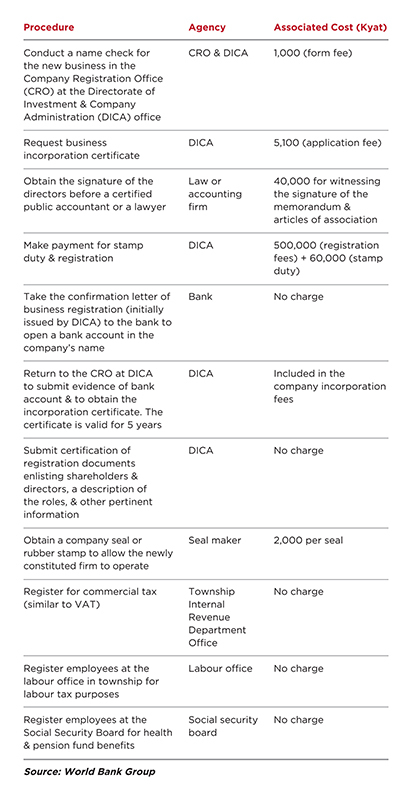 Myanmar currently offers two options for foreign investors who want to register a business entity in Myanmar – a MCA (Myanmar Companies Act) company or a MIC (Myanmar Investment Council) company. It is possible for foreign investors to own 100% of either one… The challenge, however, lies in learning how to make opportunity work for them while navigating through the crisis and be agile.” – Sarah Hii, Co-Founder of Office Hub Services, Singapore, and Yangon. This 3-day event not only showcases products like food processing and packing technology, but also brings a platform to share experiences and updates on the latest in the F&B industry. Organized by API99 Resources Pte Ltd, the international trade event will showcase the latest in Myanmar’s agriculture, beverage, food processing, procurement, allied sectors produce, and manufacturing practices in Myanmar and abroad. This trade show will bring together the stakeholders of the industry, the central government, and the states government – combining academicians, farmers, NGOs, governing associations, and foreign companies in related sectors on one platform, to explore business partnerships worldwide. This 3-day event showcases products like tea and coffee, food and beverages, wine and spirits, food servicing, food service equipment, kitchen equipment and supplies, hospitality equipment and supplies, hospitality services, spa services, lifestyle services, wellness services, and other technologies. This international event is a perfect avenue for exhibitors wanting to explore abundant business opportunities and connect with individuals in the F&B, tea and coffee, and travel and tourism industries. 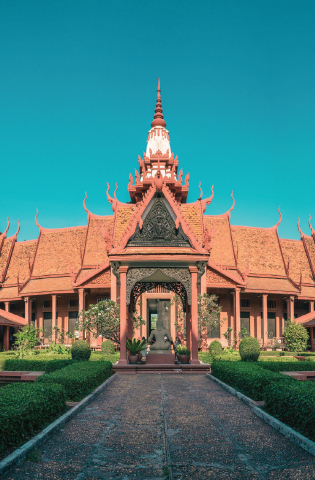 Despite having the eighth wonder of the world in its backyard, Cambodia has proven that the nation is more than just its’ Angkor Wat. 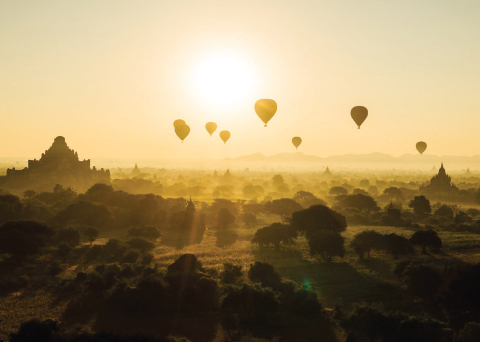 The Khmers have struggled through years of bloodshed, civil war, and economic hurdles thanks to an unbreakable spirit and a strong measure of optimism. 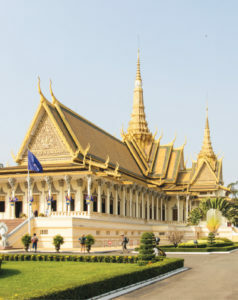 Cambodia continues to expand in tourism as the economy does, hoping to tap into natural reserves and overseas investment. Siem Reap has grown into a tourist hub in the recent years, especially considering its drop-off point for Angkor Wat (translated as the “city of temples”). The temples of Angkor are the point of pilgrimage for all Cambodians up to this day – a perfect fusion of creative ambition and spiritual devotion, and a prominent earthly representation of Hinduism and Buddhism in Cambodia. In fact, Angkor is one of the world’s foremost ancient sites and remains to be the world’s largest religious building. A typical Cambodian meal includes rice and at least three other main dishes, served alongside a soup (samlor). Desserts based on fresh fruits and sticky rice complement the meal while chili is left up to the individual to add. 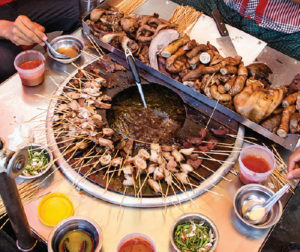 However, a big part of Cambodian culinary takes influences from a variety of neighbouring countries such as Japan, Europe, and Southeast Asia. The culinary traditions most especially highlight Vietnam and Thailand flavours. Khmer noodles. This popular dish features of rice noodles topped with green fish gravy and fresh vegetables such as green beans, mint leaves, cucumbers, banana blossom, and bean sprouts. Fish amok. 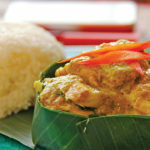 Most popular in northwest Cambodia, a mild white fish is cooked in a coconut milk base, flavoured with fresh turmeric paste, lemongrass, and fingerroot, then steamed in a bowl made of banana leaves. Lok lak. 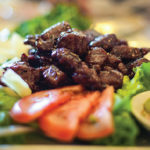 This traditional Khmer dish is basically stir-fried beef in light brown sauce, served with rice, green salad, and pepper sauce. The taste, however, varies on the chefs and regions. Khmer red curry. Less spicy than the neighbouring curries of Thailand and India, the dish is usually served at family gatherings, weddings, and religious occasions such as Pchum Ben or Ancestor’s Day. The curry is usually served with bread, portraying the long-standing French influence on Cambodia. 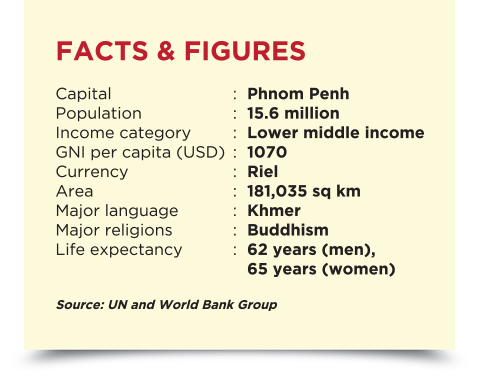 Lap Khmer. The sweet and salty Khmer beef salad features thiny sliced beef, “cooked” ceviche-style by marinating with lime juice, and dressed with shallots, garlic, lemongrass, fish sauce, Asian basil, green beans, green pepper, and mint, with copious amounts of fresh red chilies. Upscale restaurants, however, generally serve it grilled. 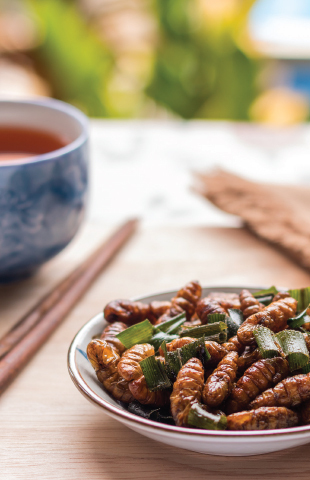 You can also find an array of fried insects on a typical Cambodian menu, such as fried worms and tarantulas. One highly recommended dish in the category is stir-fried red tree ants with beef and holy basil. To make this dish, ants of various sizes are stir-fried with ginger, lemongrass, garlic, shallots and thinly sliced beef, served with rice. There are various snacks available on the streets of Cambodia at different times of the day. Noodle soup (kuy teav) and pork and rice (bai sach chrouk) are usually sold early in the morning at small roadside stalls. Throughout the day, you’ll find vendors pushing carts around town and at small restaurants on the sidewalk, selling fresh cut-up fruits and other street food favourites such as paté sandwiches (num pang pâté), chive cakes (num kachay), fried noodles (mi char), short stir-fried egg noodles (lort cha), deep fried shrimp cakes, spring rolls, fried sausages, barbecued squid skewers, and iced coffee with sweetened condensed milk (kar-fe toek doh koh toek gok). #9 Street 460, Phnom Penh. #11, Street 178, Phnom Penh. Preah Sisowath Quay, Phnom Penh. 363 Sisowath Quay, Phnom Penh. No. 9 Street 57, Phnom Penh. 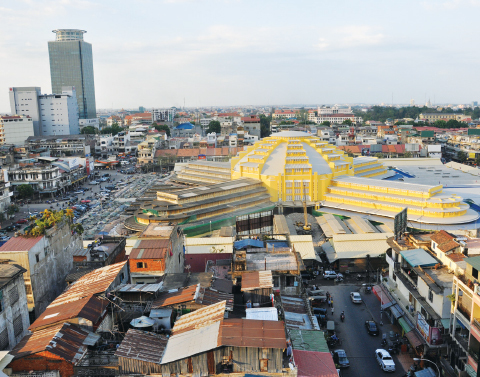 “Cambodia has been making progress in promoting a better business environment. The reforms that Cambodia has been pursuing are helping to create a vibrant economy, which will boost prospects for many Cambodians and lift them out of poverty.” – Inguna Dobraja, World Bank Country Manager for Cambodia. Effective networking is a good way to get ahead in your startup if you’re looking into building your business in Cambodia. This is a small nation with a relatively compact business community, which can be used advantageously to obtain potential clients and business networking opportunities. 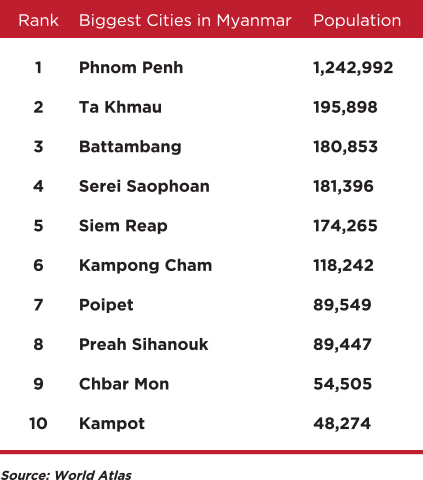 Bar Camp, TEDxPhnom Penh, CoLab, and HackerSpace Phnom Penh are some of the collaborative platforms you can get involved with as the first step of building your business network in Cambodia. This 3-day event showcases products like farm input, milling equipment, cultivators, food additives, and machinery equipment for modern agricultural activities within the agriculture and forestry industry. 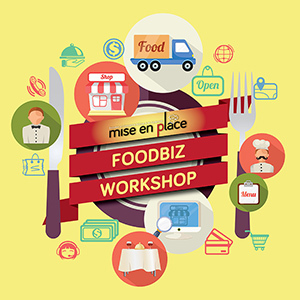 This event aims to educate the F&B industry within Cambodia. It showcases products like cafes, catering, bakery, confectionery manufacturing, furnishing, design, hospitality, food management, and IT and systems.